I love to sleep. 8.5 hours and I am full of energy and ready to take on the day, complete with a morning workout. It’s sleep awareness week. I use to have trouble sleeping back in 2008. I took Ambien, Advil PM, Tylenol PM. I couldn’t sleep with the use of over the counter sleep aids. Plus I felt irritable and hung over in the AM. With Jet Lag from international travel, coast to coast time changes and red eyes, I needed to perform as an athlete and make my appearances and train. I read sleep books, I asked doctors. I asked friends who were athletes and successful in business. I finally went to a sleep institute. After two weeks I learned how to take care of my health and I learned how to sleep and how to turn off my brain. I’m no doctor, but here’s what works for me. I don’t always sleep well. But I have overcome the label “I’m not a good sleeper.” Friends make fun of me when I say goodnight at 8 o’clock. I’m asleep by 10 o’clock, but I wake up at 5:30 am with boundless energy. Here are the things that have worked for me. Please share what things help you get the right amount of sleep in the comments! 1. Figure out how many hours of sleep you really need to feel good. Is it 4, 6, 9 hours? It varies person to person, so find out what works for you! 2. No heavy talks or working within 2 hours of going to bed. Use the day time for problem solving and resolving issues. For me, the cutoff is 7pm. 3. Have a night time routine before bed. Mine includes taking a bath, laying out clothes, water, snacks for the next day. I also set time aside for vanity and dental hygiene. 4. I take 5mg of Melatonin. This brand is what I take and love. 5. Stretch before you go to sleep. 10 minutes makes a huge difference for my back and my brain. 6. Stop caffeine use 8 hours before bedtime. 7. Keep the lights low one hour before bed. Relaxing music, or watching something calm on tv is good. Try and stay away from the News and violent tv shows! 8. Find a sleep meditation to practice if you have trouble falling asleep. Here’s a good podcast to checkout! 9. Stay in bed for at least 7 to 9 hours. Whatever is ideal for you. Even if you can’t sleep, stay in bed. Read a book, watch a relaxing tv show, and let your body rest. Try these sheets on Amazon. They are affordable, comfortable and hypoallergenic. I love having nice sheets on my bed, it makes laying in bed more enjoyable. Stick with it! Commit to good sleep habits for a month. The biggest change for me was letting my brain rest. Let me know what works for you! Winter is never a favorite season for golfers! Many days are spent watching golf and counting the days until courses open again. But fear not! The winter season does not mean that you can’t improve your swing, game and be ready for the 2018 season. Most professionals take an off season. It’s good for the mind and body. But then they come out fresh and ready! Here are some things you can do if you are reading this with your favorite courses under snow. It is great practice to simply work on your putting stroke on the carpet inside. All you need is a straight line. Put down a piece of duck tape, 24 inches on the tile and work on your stroke. If you do this with good form 100x a day, your stroke will be more consistent than when you took your winter break. Really stretch and actually do it. 15 min a day. Put a towel in front of the TV or stand in golf posture and work on your rotation, stretch your shoulders, hips, and hamstrings. You’re going to be watching football, so take the commercial breaks and get in some stretches. This is a great time to get your clubs re-gripped. The rain and sweat in those grips adds up. There is no better feel than a fresh set of grips. Its your only connection to the club. Start the season with new grips. When a tour player is making a swing change, oftentimes they don’t do all the work on the practice range. A great place to make those swing changes is in front of a mirror, inside. You can work on your set up or on your shoulder turn. If you are instructed to change your grip, then this is the time! Get comfortable with a new grip in the winter and swing in front of the mirror…carefully! No reason to wait until the weather is better. Most golf teachers have an indoor or covered facility. Go into a TopGolf, Golfsmith, Roger Dunn and get your swing analyzed and see where it’s at and evaluate what you need to work on to get dialed in before the season. You knew it was coming! Getting your core stronger equals longer drives, more consistent shots, and a natural brace to prevent injuries. Find a way to make core strengthening more enjoyable. Get it done early in the day, in the gym, or watching the news. It’s a must for golf and life! By now you know what to work on in your swing. Swing inside 100 times a day. Go through the swings meticulously. Feel what you are trying to do. This is really important practice and the best way to stay sharp and break the habits of last year. You can do this inside and it’s so important to make sure that your clubs loft and lie have not changed. Also that your clubs are actually set up for you!!! Check your wedges and make sure everything is in order. No need to have an 8 iron & 9 iron that have the same loft. It happens. Clubs change through travel and cart use. Enjoy the last few weeks of winter and work on these 9 tips to get you ready for your Best Golf season yet!!!!!!!! I am not much of the wait until last minute type. But still there is always a person that comes up at the last minute, and you are not sure what to give them. Here are a few of my favorite things this season, and also gifts that I have purchased in the last week for friends, family and parties. No gift cards, and these are in no particular order. 1. Beats Headphones. Over the ear and wireless. It does not matter how many pairs I have, I always get excited about a new pair and also a new color. 2. Travel Luggage. New golf travel bag or a roller bag. I travel a lot and good luggage is key! I use Club Glove. Its light and waterproof and can be linked together. It makes traveling so much easier. Buy a bright color so the new luggage doesn’t look like every other black suitcase! I travel with purple and I buy friends red and camo. 3. Book. 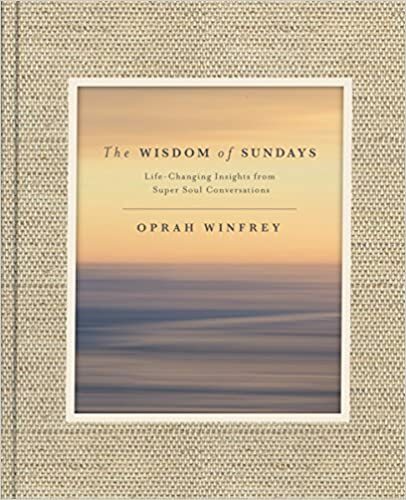 I have bought Wisdom of Sundays by Oprah for all of my female friends. It’s so good. It’s a must read. My second favorite gift book is The Success Principals by Jack Canfield. Its a must read for anyone that wants to get from “where you are to, where you want to be.” I read it every year. Give a book that inspires you. 4. Journal. Write in the first page, it makes it very personal. Everyone needs a place to write. A new journal is a fresh start. 5. Game. I love games! 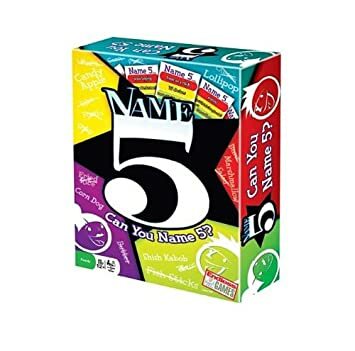 My new favorite is called Name 5. My all time favorite is Scategories. 6. Best Golf Gift is a New Golf Bag. I love to get a new golf bag. On Tour at home. The new Taylor Made light carry bags are great. Bags go through the elements in the year. 7. A lesson to get better at something. At golf, cooking, photography or anything else. One of my favorite gifts to get and give is a one hour lesson to just get better. 8. Chili Pad. its an amazing addition for couples! It keeps the bed cool on one side or warm on the other. It solves many sleeping temperature challenges. 9. Sunglasses. I love getting new Sunglasses!!! Pick a company that gives back. Diff is fun! Plus for every pair, they sell then donate a pair of reading glasses to some one in need. Eyes on Africa. I love companies that give back. If you did not find what you are looking for, let me know, I can post more! Please let me know what you guys think are great last minute gifts also. I love getting new ideas! As many of you know, my greatest professional accomplishment was opening up the Natalie Gulbis Boys and Girls Club in Las Vegas in 2010. Every day since, it has remained one of the most fulfilling aspects of my life. From time spent at the club enjoying laughs with the kids and working on golf fundraisers, it has all been more rewarding than I could have ever imagined. The kids are absolutely amazing and take such incredible pride in being a part of the club. They are so grateful for every field trip, tutoring session, any activity that the club provides. To this day, one of my favorite parts of coming to the club is the overwhelming excitement and warm hugs I’m greeted with every time I visit. I love hearing stories about what each individual has accomplished since my last visit. Some of the photos include painting pumpkins for breast cancer awareness month, time at the golf course, and a field trip to a playground to play golfball (a combo of golf and baseball). I can’t believe that this is the 15th charity golf event I’ve been involved in benefiting the Boys and Girls Clubs. This year we are excited to move to a new golf course, Spanish Trail. Last year will be hard to top with the generous donation from PGA tour star Ryan Moore and the opportunity to host a golf clinic with my coach of 17 years, Butch Harmon. Last year, despite arriving by helicopter, the 2015 champions couldn’t repeat. Maybe this year the helicopter ride will give 2016 champions the motivation they need to get it done again. I can’t believe that this year’s event is just a week away! I’m excited to share photos with everybody during the day and throughout the process. For those of you who don’t know, the Boys and Girls Clubs provide after-school programs for young people, helping millions of kids and teens develop essential skills, make lasting connections and have fun. Club members experience a safe place to learn, play and grow with caring mentors, enriching programs, experiences, and activities.